I became a captain for a Bike Month Challenge team for the first time in 2014. The year before was my first year being part of the Challenge and my first time commuting to work by bicycle. I only became captain because the previous captain was going on vacation for the month. I was really unsure of becoming a captain because I was not an experienced commuter and I was afraid that no one would want to join my team. But I am so glad I did, and I cannot imagine not being a team captain every year! First, I had to set up the team on the challenge website. The Juneau Rides page really helped with this. Then I asked all those that had been part of the previous team to join. There was still room on my team, so I asked a couple of co-workers that were thinking about commuting but were nervous about not really riding that much. I assured them that even if they only rode a few times, they were still a valuable member of my team. I answered questions about how to sign up and forwarded them information about happenings around town I received from the Juneau Rides newsletter. That was all I did the first year, but those new commuters had me hooked and I was already making plans for next year. I had one team member that only rode once the entire season, but that was a huge accomplishment to get over her fear. I was inspired to get more folks in the office out riding. The next year I enlisted the help of another co-worker to be a team captain with the promise that I would help her with any questions she had. I sent out word to the entire office that we were forming teams for the bike challenge. We ended up with two complete teams! I also decided to put on a few events to build comradery among the teams. Each week I sent out an email encouraging my team to ride and log the miles. Then we planned a fun events for the office. The first week we had a “Bring it by Bike” potluck. Everyone in the challenge would bring an item to share and the only rule was that it had to be brought to the office by bicycle. The entries where amazing, but especially the “Commuter Cake” that came in from the Valley!! We had so much food left over we shared it with the rest of the office. 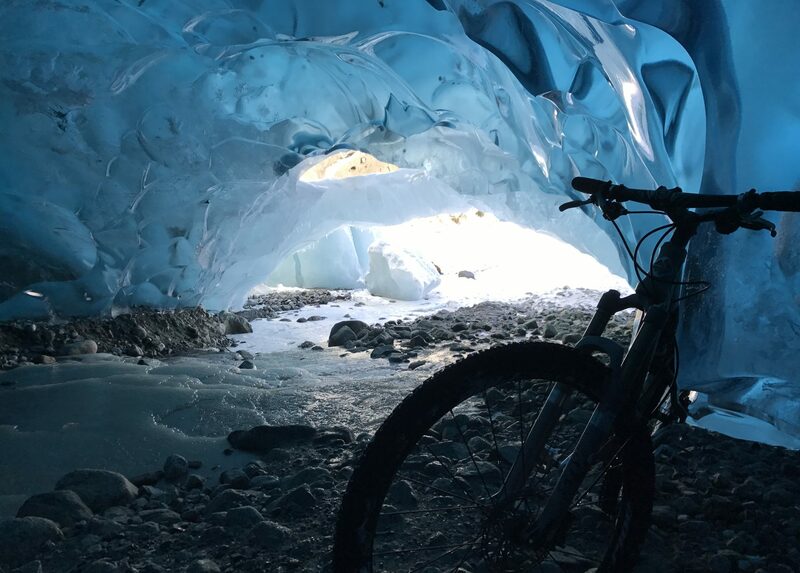 The next week was Bike To Work Day and I simply shared information about the events around town I found on Juneau Rides website. Next up was “Bike around the block with the Boss”. We invited the bosses to ride around the block with us at the end of the day and then met up for a scoop of ice cream. Even though not all the bosses rode bicycles, they did come out and cheer us on and most importantly ponied up for the ice cream. Finally, we had an end of season pizza party to give out prizes for most enthusiastic, most improved, most commutes, and most miles. The “Commuter Cake” contribution to our Bring It By Bike potluck. Remember the teammate that only rode once the previous season? She won most improved and rode at least once a week to work, plus other times outside of work. In fact, “most improved” is the category many are vying for this year. The funny thing is I was gone almost half of the month, but by setting up everything beforehand, being about to communicate remotely with the team, and having awesome support from the other captain it was a successful season. 2016 brings another year and I plan to continue to be captain and add more fun events to the schedule. In fact to date, we have four teams formed in the office and it looks like we might need a fifth. While being a captain seems like a lot of work and might be daunting at first, the inspiration that the other team members give you and the ease of putting it all together make it all worthwhile. Don’t think you need to be the perfect commuter or ride lots of miles to be a team captain – You can do it! Ask people around the office that do commute or that you know ride their bicycles a lot. Also ask the people that might not ride yet, but just need the nudge from you to start. These are always the most rewarding folks to see out riding their bicycles. Remind folks that it not just a “commute” challenge. They can ride anywhere for any reason and it counts. Finding a name for the team can be lots of fun. Enlist help. Lots of fun comes from combining your profession with bicycles into a meaningful name. Start small (or not). Do only as much as you can. Being a captain can be really easy and take almost no time. But once you do it, you might want to add internal office challenges or other events. Steal the ideas from above or add your own. Use the Juneau Rides website, Facebook page, and email newsletter as much as possible. They are a great resource.